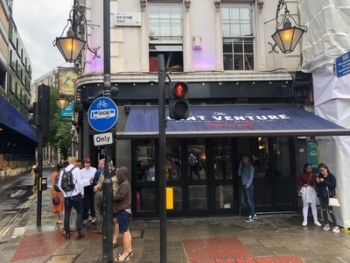 On Friday we covered the opening of Virgin Atlantic’s pop-up pub, “The Joint Venture”, at 33 New Oxford Street. I said that there would be quizzes during the week but I didn’t have the details. “Thank you for your posts about “The Joint Venture”. I went to the quiz last night and my team took home 3rd prize (which was a gift bag with bottles of beer and pint glasses). It was good fun and being an American expat was a big advantage. First prize was exactly as advertised — free economy tickets for each member of the four person team. The team that won appeared to be pub quiz pros. They finished with about 10% more points than the runner up. Good luck to anyone who pops down there tonight. Here are the rules. You can learn more about the pub, which is open until Sunday, on the Virgin Atlantic site here. Car rental group Sixt is running an exceptionally generous deal with Emirates Skywards. You need to book by 30th September for rentals until 30th November. Whilst you might not be an existing Skywards collector, it is worth remembering that you can convert them into Heathrow Airport shopping vouchers (6,000 miles = £20) or use them for a discount on a hotel stay. Radisson Blu and Radisson Blu Edwardian have launched what I think is their first ever cashback deal with American Express. This offer will be showing on the offers tab on the online statement page of many, one or none of your American Express cards. You will receive a £30 statement credit with a spend of just £100. The offer is valid until 14th October and is valid at participating hotels in the UK, Belgium, France, Germany, Netherlands, Spain, Sweden and Switzerland. Check the detailed hotel list on the Amex website in the offer terms before you book. Whilst not reviewed for the site, I also stayed at the Radisson Blu Edwardian Manchester last year and was impressed. OT: Can I pool my brothers SPG points (or soon to be Marriott) with my own? Already have my wifes linked. Does he have to share same address? In my experience, the limit is on receiving. It is waived if the poiyts are needed to make final payment on booing. Thanks guys, he doesn’t have an SPG account at all yet so I’ll get him to set one up first. O/T Hello. I’m hoping to receive some advice re transit times in Hong King. I need to get to Brisbane this winter and am hoping to utilise 2 x BA Amex 2for1 vouchers as far as Hong Kong. BA27 arrives Hong Kong 16:55 and I can book QF98 to depart 19:05. As these will be two separate tickets I’m assuming bags will not be interlined between BA and Qantas. Therefore will 2hours and 10 mins (assuming flights on time) be enough time to collect and recheck bags for flight to Brisbane? Your advice and guidance would be gratefully received. Unless you’re short of time, isn’t this a perfect excuse to have a night in Hong Kong and head to Brisbane the next day? It is enough if you rush and know exactly where to go. If the BA flight is late by a few minutes you will be stuck though. I wouldn’t do it without interlining and BA absolutely won’t. The HK transit desks used to be able to retrieve bags and retag them on your behalf when on separate tickets, but I’ve heard that this has stopped, and I never really transit HKG since I have a place to stay there. Every time I’ve been through HK airport I’ve found everything from check-in to baggage reclaim to be absurdly efficient. I’d say you’re more likely to have problems with your BA flight being late. If your pilot announces a delay leaving London, you’ll spend the entire flight having palpitations, and won’t enjoy your LPGS. I’m with Lumma – have 24 hours in Hong Kong instead! Go and eat at Din Tai Fung, explore Temple street night market, get on the Star ferry, climb Victoria peak, and then experience the check-in at Kowloon MTR station, rather than the airport, just for kicks! Thanks very much for these replies – very helpful. Will consider best course of action. HKG has a very congested airspace, I recommend you take the advice and go for longer layover or stop overnight in HK. Personally I wouldn’t do it. even if you would be departing from the same terminal you have absolutely no margin for any lateness on the incoming flight at all. Wouldn’t have needed to buy the points if the Amex CC points had transferred in time! Irish call centre did the upgrade and applied to reservation in about 10 minutes of hold time. My SPG points that left amex on the 14th of July hit today. Managed to book two award nights before they go up later this week. Would you mind sharing why you chose to do this now rather than wait until after 18th Louise? I’ve been pondering a similar decision all day, my main concern is that there will be a flood of bookings soon after merger and availability might be an issue one month later when existing certificates are sorted. I upgraded from cat 1-5 to 8 today as my plan was always planning to upgrade when it came to book bt this would most likely cost a lot more points post 18th assuming they use the new travel package rates. Interestingly the Irish CS rep said the categories were going to map directly across so my current cat 8 would become a new cat 8. When I asked what would happen to cat 9 and above he said they would become cat 8 and have points refunded so no-one would lose out. This would be great if it’s true but seems a bit unlikely I think, especially as cat 8 doesn’t even exist until Jan. Thanks Mark, did you have to make a hotel booking or is it possible just to upgrade the certificate without using it? The mapping described to you is consistent with what some have been advocating from the outset. Not long until we knos for sure. I didn’t have to make a reservation. Just called up and asked to upgrade and he knew what I was talking about and did it straight away. Took about 10 mins including wait time. The upgraded voucher was in my account when I checked 20mins later with a new expiry date of 15/8/2019. Cheers Mark, I will upgrade one of my two tomorrow then. Original plan was to use for cat 9 but don’t have the points in time so settled for a cat 7. Thanks Louise, after helping my partner buy a cat 1-5 package I am left with 72k Marriott rewards points. My dilemna is to use those to upgrade to a cat 7 on my package like you did or keep them for miles or hotel. If they map both old cats 6 and 7 to new cat 5 which seems likely to me I would then be hoping to get 30k points refund due to difference between old cat 6 and 7. In effect it would mean a new cat 5 for 30k points net instead of 60k points if I upgrade after 18th. Those 30k points saved could be 3 nights in a decent tourist class hotel in Asia. I think I’ll get on the phone. I’ve got 25 current offers with my BAPP card that I’ve had for 5 months. Probably took 2-3 months before I started to get a significant number of offers. OT: Anybody able to confirm yet if we get the 2500 M&M bonus points on Hilton group rewards stays paid entirely with points but with incidental on the bill? Thanks, were they all 100% points or were some points and cash? I had a cash stay and registered for the promo but no M&S miles here either. Either they fixed the it so you can’t get points and miles anymore or something went wrong. Presumably you are chasing it up? Don’t see why you should not get both points and miles and there is no way to opt out of points. Special miles bonuses have stacked before. Sounds to me more like they broke it than fixed it. O/T re Curve just had an email they are changing my credit card to a debit card, asking if I want a personal debit card or a commercial one, anyone know the difference? They didn’t ask me anything, just sent a new card and my partner got a new one as well, albeit slightly differently packed. I don’t understand how you can commit fraud any easier than any other payment method. Surely the answer isn’t to withdraw it but to make the system more secure. For the last couple of weeks we have had to have management authorisation when using the Pay+ app. The guy at our local store said some people had gained access to photographs of staff pay+ codes and were using them to get staff discounts – hence the security check at the tills. Ahh I wondered what was going on – had that issue yesterday and was asked if I was a staff member! Also had to have code rescanned a few times. When I contacted their Twitter team they said it was a known issue if you had a Tesco Bank Clubcard attached and to switch to a regular Clubcard instead (they confirmed usual bonus points would still be applied).